Ben Webster was cooler than you. The Kansas City native's ballad work, as exemplified by his playing here on "Chelsea Bridge," could make you cry. It doesn't hurt that he's abetted by sterling musicians at this 1959 television session. Here's a bit of solace- pianist Hank Jones is still going strong at 79. *Joe Klopus has me excited about Dennis Winslett's new band. *Food'n'Things congratulates Dean Hampton on his official status as an Elder Statesmen. *The Croatian men in the Donna Lee Saxophone Quartet base their sound on Bobby Watson's 29th Street Saxophone Quartet. There's even a video. Go figure. *Are you soaking up the Art Pepper documentary on YouTube? It's hip, man. The death of Gregory Hickman-Williams on August 26, 2006, was a devastating loss. The vocalist had just completed the amazing Passages. I wrote a glowing review of the album while Hickman-Williams was hospitalized. 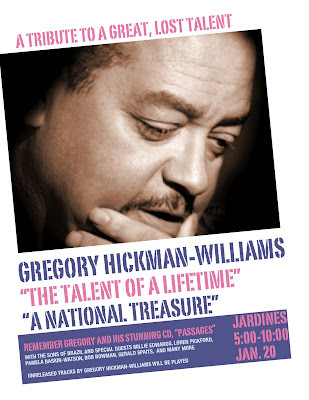 Per this handbill, a tribute to Hickman-Williams will be held January 20 at Jardine's. The YouTube treasures just keep on comin'. Here's beloved Kansas City jazz personality Ruth Rhoden interviewing guitarist Emily Remler in 1989. Unlike Rhoden's infamous exchanges with Ginny Coleman on KCUR's Just Jazz, her conversation with Remler is merely mildly awkward. Here's some live footage from the Boulevard Beat, which I believe was located in the space now occupied by Lulu's Thai Noodle Shop at 333 Southwest Boulevard. Remler died the following year. *Hey, the jazz museum followed through on my idea about hosting a jazz film series! They even kicked it off with a Basie-themed night. What's that? Oh. Unfortunately, the series is happening at the National Jazz Museum in Harlem, not at Kansas City's American Jazz Museum. *The Rocky Mountain News gave Charles Gatschet a nice gig preview. *Plastic Sax readers know I'm extremely fond of the Foundation's "Rush Hour" on Fridays. Harold O'Neal is on tap this week. *It's only indirectly related to jazz, but this interesting feature story in the Los Angeles Times concerns a documentary film about Kansas City's downtown revival. I often wonder if I'm the last person in Kansas City still spending money on jazz recordings. After all, everything's free for savvy internet users. And sadly, the population of Stan Kenton fans is rapidly diminishing. Back in the day, Kansas Citians could easily acquire jazz at Penny Lane, the Music Exchange, Classical Westport, Recycled Sounds, Exile and many other music purveyors. Today, the nearest Borders outlet probably stocks the new Keith Jarrett and Stacey Kent discs, but fans are forced to go online for Matthew Shipp and David Ware. Rejoice, fellow fans of Kansas City jazz! Over an hour of footage of Jay McShann leading an all-star band in a tribute to Charlie Parker has been posted at YouTube. It's apparently from a 1989 French documentary. I'm ecstatic about discovering this priceless material. The video featured above is the film's introduction. It contains rehearsal and formal concert footage of jazz giants including Carmel Jones, Phil Woods, Al Grey, Clark Terry and Benny Carter. Terence Blanchard is the only young guy in the group. Here are links to just a few of the related videos. This one features Jimmy Heath's excellent explanation of Parker's legacy. McShann is interviewed here. His distinctive accent always cracked me up. Max Roach and Dizzy Gillespie work out a chart in this clip. Prepare to shed tears of joy. *Those who appreciate Kansas City's several outstanding jazz guitarists are advised to check out Wichita's Jerry Hahn. He plays like an angry Jim Hall (that's a compliment) in this 2006 performance at Jardine's. The video also features an excellent Joe Cartwright solo. Hahn plays the Blue Room on November 19. *Sometime Plastic Sax contributor Dan Jaffe is profiled in a Florida newspaper. *Our old friend Lee turned me on to a 14-second clip of live jazz at YJ's. *The Star reports on a jazz-related art project downtown. *The UMKC student paper reviews a night at the Blue Room. 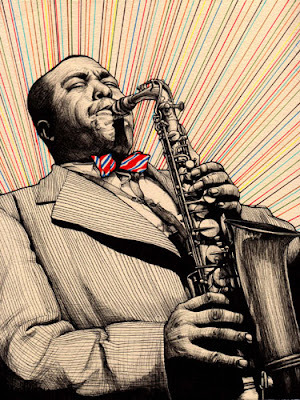 *Add Weather Channel viewers to the long list of people who hate Charlie Parker's music. *Don't forget that Bill Charlap, the "new Bill Evans," headlines at the Folly Theater this Friday. 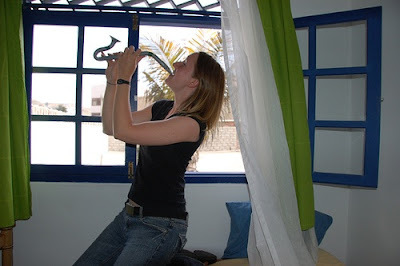 If you've managed to find your way to Plastic Sax, the most remote corner of the internet, you're probably already aware of Pandora. The innovative service creates customized streaming radio using its "Music Genome Project." It shouldn't work; but it's uncannily effective. I've been tinkering with a Plastic Sax Radio stream for a few weeks. Click on the link to hear the results. Because Pandora doesn't allow users to set parameters by geography, Plastic Sax Radio will forever be a work in progress. But it'll play Kansas City institutions like Mary Lou Williams, Charlie Parker and Andy Kirk with regularity. And my love of early Basie makes the system think that I want to hear the likes of Les Brown and even Michael Buble. So please don't blame me if Sammy Davis, Jr. pops up. Just skip what doesn't suit you. In theory, each alteration brings you one step closer to musical bliss. But beware- Pandora can encourage consumerist tendencies. It has me coveting an out-of-print Don Byas album I didn't know existed. When Tim Anderson, Pandora's founder, visited Kansas City in February, he reiterated that all submissions it receives are added to its database. Yet pitifully few of the Kansas City artists featured in the right column have their music listed at Pandora. I wish I could have Mark Southerland, Harold O'Neal and other innovators featured, but alas, they're not available. Mike Metheny and Doug Talley are among the few local artists taking care of business. The addictive diversion is entirely free; the only drawback is that it seems to drag computer speed down a couple of notches while it's running. Does Harold O'Neal represent the future of jazz in Kansas City? Area jazz fans should be so lucky. The original composition O'Neal performs in this video is dedicated to innovative pianist Andrew Hill, who died in April. As with Hill, O'Neal deftly balances outside explorations with the post-Art Tatum tradition. O'Neal works frequently in Kansas City and New York, and is a pianist in one of Bobby Watson's touring ensembles. O'Neal's debut recording as a leader, Charlie's Suite, is reviewed positively here. His MySpace account is slightly less buggy that his own site. 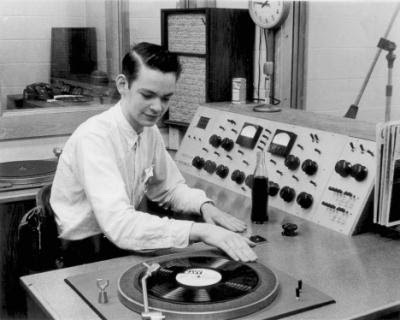 I also highly recommend the three free downloads recorded at Denver's KGNU. *NPR offers a preview of Karrin Allyson's next release. She's joined by guitarist Rod Fleeman. I'm partial to the Randy Newman cover. *Joe Klopus urges the passive jazz audience to frequent clubs and concerts in a thoughtful editorial. I agree with everything Joe writes, but it's telling that fans of country, rock, R&B and blues don't require any such prodding. *I heard a song from Alice Jenkins' new Almost Christmas release on The Fish Fry, but there's no mention of it at her site. *Bobby Watson and Brian Kennedy aren't the headliners at the November 10 fundraiser billed as a Buck O'Neil birthday party. That'd be Morris Day and the Time. 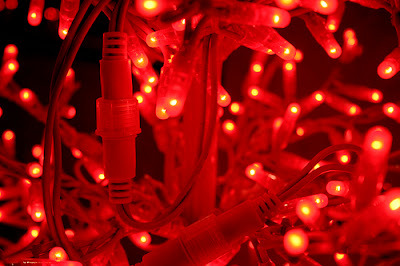 *I sure hope Santa brings me the new Roy Haynes retrospective. Has anyone else recorded with both Charlie Parker and Pat Metheny? *Alaadeen's new release received a brief but positive review in Jazz Times. *I just discovered that the Lawrence Public Library hosts a jazz film series. Unfortunately, it concludes Friday. Does Kansas City Care About Charlie Parker? 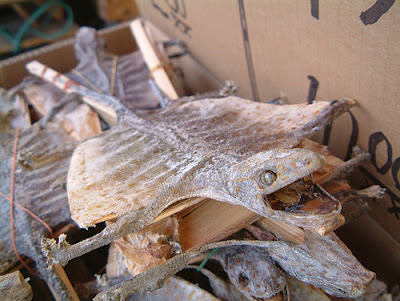 The following is an abbreviated version of an essay I wrote for another site in June 2005. I attempted to decipher the meaning behind the sales tabulations of Charlie Parker's recordings. I no longer have have access to Soundscan, the music industry's primary sales reporting tool. Local sales of Charlie Parker’s recordings tell a far different story than the happy version recited by Kansas City's cultural and political elite. Soundscan lists 328 individual Parker titles. Of these, 79 have zero sales. Assuming that those 79 titles were never issued, that leaves 249 actual titles. The total sales for those releases since 1991 is 1,496,695. The average sales per title is 6,011. The average cumulative sales per year is 106,906. While those numbers aren’t world-beaters, I find them entirely palatable. Jazz is a difficult music, and Parker was anything but smooth. The bebop revolution, led by Parker, remains controversial to this day. Along with the advent of rock’n’roll, the gauntlet laid down by bebop permanently displaced jazz music from the forefront of the American popular culture. By comparison, today’s most acclaimed serious jazz saxophonist, Joe Lovano, averages sales of 15,000 units each of his Blue Note recordings. Keep in mind, too, that sales of Parker in Europe and Japan are likely at least a significant portion of what they are domestically. Of course, it’s all relative. We live in a world in which country-pop star Toby Keith sold 125,000 units last week. It’s no surprise that the three best selling Parker titles are on Verve. First, Parker made his most commercial recordings for the label, including the controversial "with strings" sessions. Secondly, Verve enjoys major label distribution, which helps force product into retail. Jazz ‘Round Midnight, the top seller, was issued in 1991, and has sold 126,475 units, including 49 last week. Ken Burns Jazz, compiled in conjunction with the PBS series, was issued in 2000, has sold 90,039, including 107 units last week. Bird: Original Recordings, issued in 1988, has sold 104,753, including 26 last week. The title I recommend most highly, a budget-priced 5-CD set called Studio Chronicle: 1940-1948, has sold 3,010 units since its release in 2001, including 17 last week. But what about sales in Kansas City? Jazz ‘Round Midnight has sold a total of 939 units in Kansas City, including 2 last week. Ken Burns Jazz has sold a total of 721 in here, including 1 last week. Bird: Original Recordings, has sold 851 in Kansas City, with no sales last week. The Studio Chronicle box has sold a woeful 10 units in Kansas City, including 1 last week. Kansas City is Soundscan’s 29th largest market. Correspondingly, even dismissing favorable regional hometown bias, Parker should account for every 3 in a 100 Parker sales. Does it? Not even close. Kansas City represents significantly less than 1% of total sales in the United States. It's easy to take Bobby Watson for granted. The genial saxophonist has retained his Kansas City-style friendliness in spite of his status as one of the most respected artists in jazz. He's featured here with what appears to be a Russian student band. That's not surprising. Not only is Watson UMKC's director of jazz studies, he also travels the globe with the frequency of a Fortune 500 CEO. His solo commencing at the 2:25 mark is typical Watson. He opens with beautifully lyrical playing and gradually builds to an ostentatious but completely logical peak. Just because we get to hear this brilliance regularly in Kansas City doesn't make it any less extraordinary.